What does Sportslick smell like? What does Sportslick feel like? Does Sportslick offer sun protection? Can Sportslick prevent blisters, rashes and chaffing? Will I have an allergic reaction? What do I do if I get Sportslick in my eyes? Will I breakout with acne if I use Sportslick? Can Sportslick cure my Jock Itch and Athletes Foot? How do I remove Sportslick? What ingredients are in Sportslick? Are there animal derivatives in Sportslick? Where can I buy Sportslick? Does Sportslick contain FDA approved ingredients? How much does Sportslick cost? What sizes can I purchase Sportslick in? How do I use Sportslick? Can I apply Sportslick under my wetsuit? Why do cyclists use Sportslick? Why do runners use Sportslick? Why do swimmers use Sportslick? Why do triatheletes use Sportslick? Why do skiers us sportslick? skin lubricantion • antifungal • antibacterial • healing scraped skin. You will enjoy the mild vanilla scent, which is a natural oil fragrance. Since it is a lubricant, you'll notice it has a nice silky feel. Sportslick Solid (the stick) has SPF 20, making it great as a lip balm. The Sportslick gel (in the tubes) does not have SPF protection. Sportslick was designed specifically to help prevent blisters, rashes and chaffing. The soothing aloe, antioxidant vitamins A and E, and other natural ingredients moisturize and rejuvenates your skin. Sportslick is an antibacterial (Triclosan) that is also formulated to heal scraped skin and guard against infection. Avoid contact with the eyes. If contact occurs, rinse thoroughly with warm water. 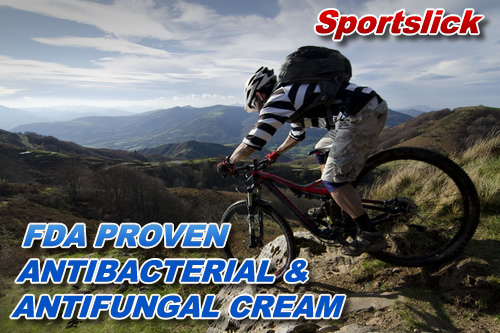 Yes, Sportslick contains Tolnaftate 1%, which is a leading antifungal agent. Sportslick washes off with just soap and water. Silicone - binds to the skin for long lasting waterproof protection. There are no animal products in Sportslick. Sportslick was created by a medical doctor who is an endurance athlete and triathlete. Sportslick was first sold at Triathlon Expos in 1995. You can purchase Sportslick right here on the website. Yes, Sportslick does contain FDA ingredients such as Tolnaftate. One can purchase Sportslick for as little as $5 (does not include shipping or). We currently offer a flat rate shipping of $5 for any quantity amount ordered online. Sportslick is sold in 3.8oz Large Tubes, .8oz Pocket Tubes, and .5oz Solid Stick. Sportslick is proudly manufactured United States, in Gardena, California at an FDA manufacturing lab. Do you ship Sportslick internationally? If shipping to EUROPE, please purchase Sportslick at: SOS SWIM SHOP. If shipping to another country, please contact us at sales@Sportslick.com for the shipping rate. Just apply a thin layer of Sportslick to any part of the skin that needs lubrication or healing. A thin layer will last a long time. Yes, it will not damage the wetsuit. It is absolutely wetsuit safe (proven by independent tests). Cyclists use Sportslick in their chamois and shoes to prevent blisters and chaffing. Runners use Sportslick in their shoes and between their legs to prevent blisters and chaffing. .
Swimmers use Sportslick beneath their armpits to help prevent blisters and chaffing. Triatheletes utilze Sportslick within their shoes to prevent blisters, chaffing or rashes. It is also utilized in wetsuits to help them slide into their wetsuit as fast as possible. Why do skiers and snowboarders use sportslick? Skiers and snowboarders utilze Sportslick within their boots to prevent blisters, chaffing or rashes. "Our team uses Sportslick all the time, and are always asked what we use on our feet to keep them in such good shape throughout these races." Sportslick contains an FDA proven antibacterial (Triclosan) and antifungal (Tonaftate) cream within the product to prevent and treat athletes foot and jock itch. © Sportslick. All Rights Reserved.